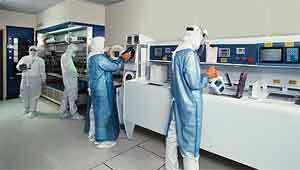 Prefabricated Commercial Modular Clean Room Sales & Installation Services Nationwide. Within any industry there are processes that are delicate, and the presence of any foreign objects or pollution can have a major impact on their efficiency. Under circumstances where you are working with products that require special care to be taken, it is important to be able to provide a location where you can control all aspects of the environment to protect your systems. There are a number of systems to choose from depending on the levels of protection your processes need, and thanks to the modular system of construction offered by Easy Rack, you can have a commercial modular clean room or environmental room installed within your existing factory at a fraction of the cost that you might expect. With any environmental room, there are a many factors that can be controlled, and these include everything from the temperature and humidity through to the amount of particulate matter that is allowed in the air. By being able to control all of these variables, it is possible to create a completely stable environment in which the optimum conditions for a process to be carried out most efficiently and safely can be created. An environmental room must, by definition be a completely separate part of the building, with its own air supply and the walls must be perfectly fitted to prevent any leakage. Thanks to the high quality of the installations of commercial modular environmental rooms from Easy Rack, you get the best quality of materials, and a room that can be fitted quickly, and be up and running as soon as it has been fully tested. A clean room takes the essence of a regular environmentally controlled room even further, adding a number of additional features to further refine the capabilities that are present. You need a clean room when your business is involved in working with very delicate equipment such as integrated circuits, or if you need to prevent any contamination at all taking place. A clean room comes with a staging area where staff can change into specially prepared clothing that prevents them carrying any dust or other contamination into the room. The most important factor to examine when looking for a Commercial modular clean room installation is to check whether the system that would be installed in your workplace is full sealed and comes with comprehensive air filtering. Easy Rack offer a fully customizable clean room solution for your business that takes into account a wide range of different factors including the materials that are used for the construction and lining of all the walls, the power systems that are installed into the room, and even the kind of HEPA filters that are included. All the commercial modular clean room installations that Easy Rack provide are engineered to allow the roof to be loaded, which allows for event greater flexibility and space saving. If you are considering your options when it comes to Commercial modular clean room sales, then remember that Easy Rack provide a system that can be installed much more quickly and efficiently than rival products, and that thanks to the special tax status afforded to products that are built in a modular fashion, the item will depreciate over 7 years rather than 39, which will provide you with a number of taxable benefits over the lifetime of the product. As you continue to read through our selection of Modular Prefab Clean Rooms, keep in mind we stand ready to answer any questions you may have about our offerings. Call us at 1-888-776-3720 whenever such questions arise and let us help you make the best investment within your budget. A CMM room provides you with a clean space within your workplace where you can escape from the stresses and inconsistencies of a busy industrial space and perform measurements in a controlled environment. Prefab Portable Clean Rooms. With modern portable clean room technology, it is possible to get all the benefits of a traditional clean and dust free work space with a great deal more flexibility than that which is possible in a traditional working environment.